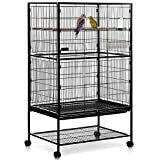 Below you'll find a selection of cockatiel cages that we've compiled from some of the UK's leading retailers. Simply click on a photograph for more information about the cage. 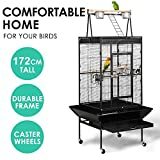 Some of these cockatiel cages are available in different sizes, so be sure to read the information to ensure it's big enough depending on how many cockatiel you have. Cockatiels need a great cage in order to thrive. They are pretty active and love to have fun, so giving them a large lofty cage is essential. By "large", 20in(w) X 20in(l) X 26in(d) is seen as the minimum you should have for your cockatiel. If you have more than one cockatiel then you will need a bigger cage than that straight away! 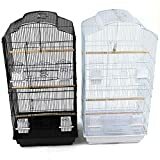 The spacing on the cage wiring should be no more than 3/4 inch simply because the cockatiel could do damage to itself by accident if the spacing was any wider. 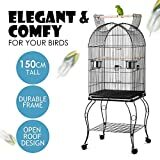 Its understandable to want to be able to have a good view of your cockatiel, but its essential you keep your pet safe over being able to see it better. 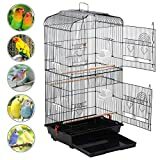 Now there are tons of cockatiel cages on the market - some expensive and some not so. 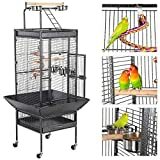 The best cockatiel cages out there depend on how you like to take care of your bird. 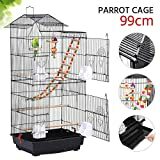 You see, if you like to put your hands in the cage and play with your cockatiel and love to be "hands on" - then you might be better with a more bog-standard cage which means you have to get more "stuck in". However, you can get cockatiel cages which have food dispensers and bases. This makes it a lot easier for you to just "do what you have to do" and not get your hands in the cage with your pet. 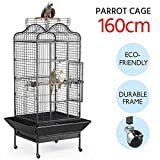 However you like taking care of your bird, it should entirely affect your choice of cockatiel cage. Since cockatiels are playful animals, its essential that they need to have a variety of toys and fun things in their cage. Cockatiel toys can be bought from a pet store and vary from large ropes to simple bells. The best and most basic toy your cockatiel will love is a rope which stretches from either end of the cockatiel cage. This will allow it to walk up and down it and even hang off it! 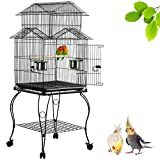 Check out this cage from UkParrotCages. Its got a whole array of toys and fun things for the cockatiels and even a top perch for when you let the cockatiels out of the cockatiel cage! Read our advice on buying a cheap cockatiel cage.